If your intention during your time at SXSW is to catch as many bands as possible, you’re in luck. Many of SXSW’s venues are close together. Usually the bigger problem is navigating around the people who aren’t as bothered from getting from point A to point B as you are. That’s avoidable if you detour around 6th Street. Is FOMO still a thing? Maybe everyone who is experiencing it just isn’t announcing it on the internet every 5 seconds. If the terrible feeling does come over you, I have a solution for those I who worry they might be missing out on the Next Big Thing. It’s not for everyone and certainly not for the faint of heart, so put on your big boy/girl pants and buckle up. 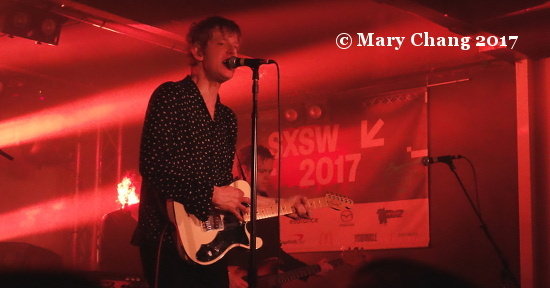 I’m going to tell you how I saw 5 bands in the span of 1 hour Thursday evening, and I will provide a few ‘rules’ on how to smash SXSW. None of the venues I visit in this summary were on 6th Street proper, so I feel like a bit of a champ rereading my schedule for the night. Rule #1: Like switching the radio station or cueing up a new song on your favourite streaming service before the previous song finishes, leaving in the middle of a set, at least to old hands at this, is not only expected but to some extent, even encouraged. Be considerate to the performers and depart quietly to minimise blocking of the view of your fellow punters. Watching a pop band and not feeling it? Step outside, go down the street, and poke your head in to the next club and get some better dance or rock into you. You’ll find it, and it won’t be far. Rule #2: Embrace venues that have one entrance and two stages to maximise your time in a venue while minimising your time in a queue. Barracuda (formerly Red 7 a few years ago), Scratchouse (formerly Holy Mountain), Cheer Up Charlie’s, Empire Control Room and its associated Garage (not to be confused with the Mazda behemoth set up this year) and the Mohawk are great examples of this. So is Tellers, where I saw my first two bands of the night, clambering up the stairs, thinking that’s where I was supposed to be. This is where I happened upon The Gift from Portugal, and what a unique surprise they were. An astounding supporter of the band and as well as collaborator is Brian Eno: he cowrote and has produced songs from their latest album ‘Altar’. It appears his golden touch has already translated to a lot of positive attention for the group. If you walked into the room not knowing anything about the band like I did, you’d probably think, “Liza Minnelli! Cabaret!” looking at camp frontwoman Sonia Tavares, looking vaguely gypsy-ish and like she stepped out of a ‘20s film. Yes, the keyword here is ‘theatrical’. 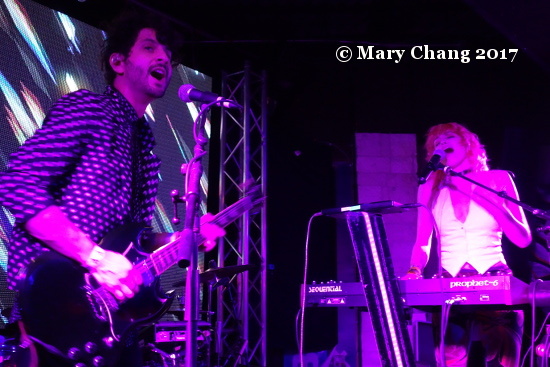 The music started, with thumping disco beats and shiny synthpop. Evidently, the hype has extended its reach as far as The Great Escape, as the Portuguese band are headed there in May. Pencil them into your schedule, you have been advised. Creaking back down the stairs at Tellers, I resumed back on my planned schedule to see brother-sister act The Fontaines on the lower level of the two stages Planetary Group had curated for the evening. The four member, self-described ‘new-wop’ act barely fit on the small squarish stage, but this did nothing to deter singer Charlotte Fontaine, resplendent in red garb, from giving it her all in her performance. Conjuring up the soulfulness of Etta James and looking as sultry as Marilyn Monroe, it was a bit of a (good) head trip. Accompanied with their bass-heavy sound bringing the funk and things back to present day, what’s not to love? Tipped by me and Tidal ahead of them going out to SXSW, I reckon this band has a bright future ahead. Thankfully, there wasn’t too long of a wait for Los Angeles electropop Smoke Season to start. 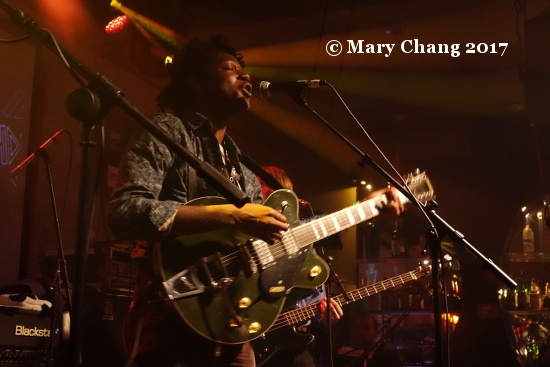 With their soulful tunes and wide smiles, Gabrielle Wortman and Jason Rosen seemed to be oblivious to the fact that people were still shuffling into the venue. 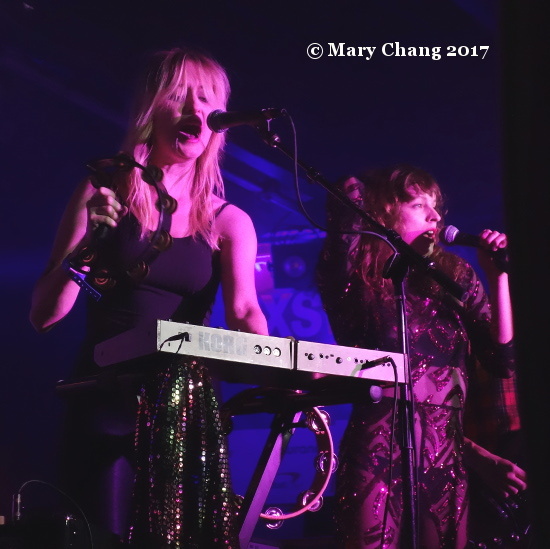 They went for it and were soon rewarded for their dynamic show, with keyboardist Wortman putting her voice through its paces. Let’s be real, there are tons of electropop groups out there right now, so what sets Smoke Season apart? Wortman’s lead vocals – not to mention her firey ginger hair you can see from a mile away – can turn on a dime, from sultry and slow burning when she wants them to be, to delicate and wispy, to emphatic in a take charge kind of way. If you’re a girl and you’ve ever wanted to be a singer, chances are her voice (with all its quirks) is the kind you’ve always wanted. (If you were wondering, my particular alto range makes this impossible, sob!) As a complete package, I find Smoke Season exciting because they’re not a one-trick pony. Equally good at dreamy numbers (‘Emilia’) just as well as more complex, in your face pop tunes (‘Loose’), I found it hard to pull myself away from their set. But as they say, sometimes needs must. Rule #2 was invoked again when I swung back west on 7th Street to Barracuda, where the Secretly Group showcase was also just coming to life. I’d seen Alex Lahey the day before at the StubHub / Culture Collide showcase at Banger’s, where she played in front of hundreds of people swilling beer and munching sausages at picnic tables. I was convinced her performance be different at an evening show, and I was at least right about the vibe. The slacker silliness and rapid fire lyrics of ‘Weekend’ worked better in full sun than it did at night, but it was still came off as fun. You just got the feeling an open-air festival would be a better venue for her. Rule #4: Know when to leave – or better yet, not even join – the long queue. SXSW old timers like me know that you can waste a lot of time queuing to get into venues when you could be elsewhere, seeing a band and knocking back a drink. While there are times you’ll want to queue for your most favourite artists, know when you spot a queue that’s around down the street and many people deep (example: Rag ‘n’ Bone Man opening Friday night at the British Music Embassy) and make a quick decision to bolt if you conclude you don’t have a chance in hell of getting in. Related to this: instead of chasing the big names and the crowds, head for a less busy venue you know you’ll be able to get in so you’ll definitely see a band. Result! 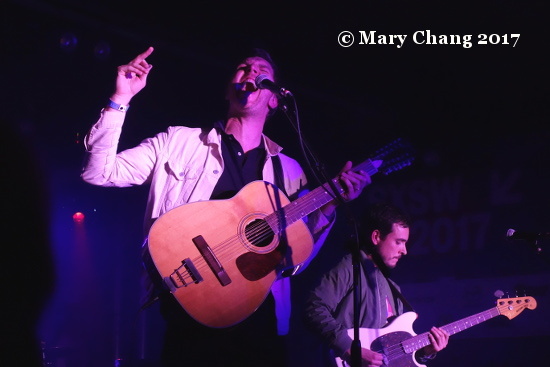 Except for James Vincent McMorrow in 2015 there, we’ve never had a problem getting into and around the inside of Maggie Mae’s Gibson Room (not to be confused with the usually more busy Maggie Mae’s proper and Maggie Mae’s Rooftop). London slackers Happyness, who are gearing up to release their second album ‘Write-in’ on Moshi Moshi in the UK, were appearing on their American label Bar/None’s night there. Running around Austin to catch as many bands as you can in an hour isn’t for everyone. But given the carnival of crazy SXSW is, I hope I’ve convinced you it is doable. In the course of its 20-year history, British independent record label Bella Union has become what you might call a “household name”, if your household were made up of musicians, music journalists, promoters, or other industry types. Headed by former Cocteau Twins member Simon Raymonde, Bella Union was originally founded as a vehicle for releasing Cocteau Twins’ own work, but it expanded to new ventures when the band broke up in 1997. Bella Union’s most acclaimed signees include artists like Fleet Foxes, The Flaming Lips, and Father John Misty, as well as TGTF alums The Trouble With Templeton, Midlake, Emmy the Great, and exmagician. 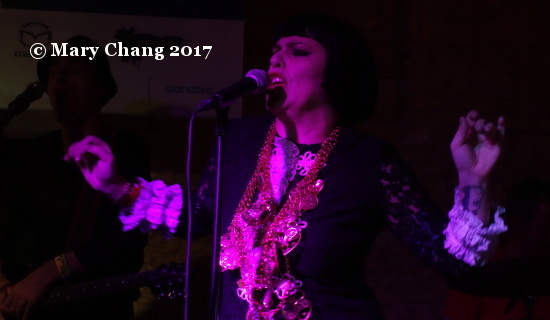 In celebration of Bella Union’s 20th anniversary, Raymonde was featured as a session panelist at SXSW 2017, along with Midlake frontman Eric Pulido (who also showcased in Austin with supergroup BNQT) and actor Jason Lee. Pulido’s appearance on the panel wasn’t surprising, but Lee was a bit of a question mark in my mind going into the Friday afternoon session. As it turned out, we had to wait a bit to find out what Lee’s role would be in the discussion, because he was delayed trying to find a parking space. Even featured speakers aren’t immune to busy downtown Austin SXSW traffic! In Lee’s absence, Pulido took on the role of session faciliator, and he led a spontaneous conversation with Raymonde about the guiding philosophy behind Bella Union. As an experienced and successful musician himself, Raymonde emphasised the “gut instinct” aspect of his label’s work, saying that he strives to release music that genuinely strikes a chord with him on first listen. Pulido remarked that Raymonde’s diplomatic criticism often begins with the phrase “I don’t love it”, but doesn’t necessarily shut the door to future endeavours from promising artists. In fact, much of Raymonde’s success with Bella Union hinges on his openness to his artists’ perseverance. Midlake’s 2006 album ‘The Trials of Van Occupanther’ garnered critical accolades, despite Raymonde’s initial reticence about its unwieldy title. Raymonde highlighted the role of artist interaction and fortuitous timing in his discussion of Bella Union’s continued success. He named Midlake’s collaboration with American singer/songwriter John Grant as a prime example. 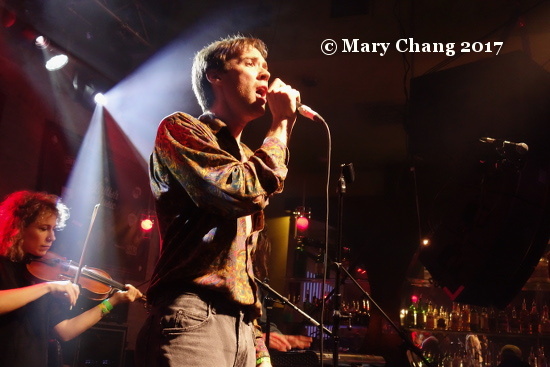 Grant, who was a longtime fan of the Cocteau Twins, had initially contacted Raymonde during his time with The Czars, and though it took some convincing, Raymonde was eventually persuaded to take the production helm on the band’s second album ‘Before…But Longer.’ Raymonde’s dedication kept The Czars afloat until they broke up in 2004, but his relationship with Grant didn’t end there. Midlake’s artistic collaboration on Grant’s debut solo album, 2010’s ‘Queen of Denmark’ brought Grant back to Raymonde’s attention, and Grant’s fruitful partnership with Bella Union was renewed, continuing through 2013 album ‘Pale Green Ghosts’ and 2015 release ‘Grey Tickles, Black Pressure’. One of Bella Union’s more recent protégés, singer/songwriter Holly Macve, also started with stroke of luck on Raymonde’s part. Macve had taken a job in a café in Brighton where Raymonde had set up a basement studio, and he happened to hear her sing at an open mic night. His ear for talent and the aforementioned “gut instinct” immediately drew him to sign her to the label. Macve made her American debut last year at SXSW 2016, garnering accolades from NPR among others, and she returned this year with a stunning debut album, ‘Golden Eagle’, under her belt. 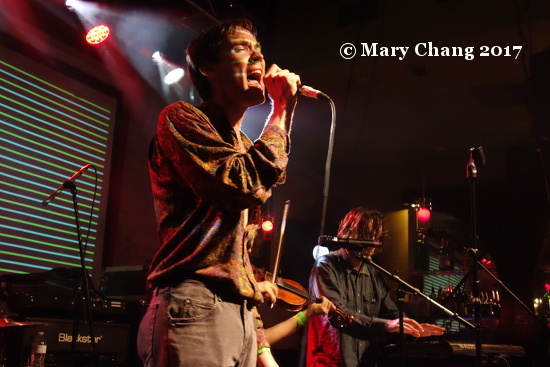 Bella Union co-hosted a 20th Anniversary showcase with TuneIn Studios on the Wednesday night of SXSW, featuring current artists BNQT, Holly Macve, Mammut, Pavo Pavo, Will Stratton and Horse Thief. High-calibre artists like these represent the future of Bella Union as the label moves into its third decade of excellence among independent record labels. 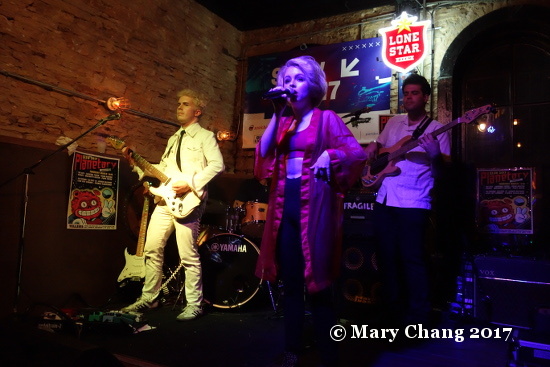 Stay tuned to TGTF for our coverage of Holly Macve at the British Music Embassy in our roundup of Thursday night at SXSW 2017. Following their second visit to America and appearances at SXSW 2017 in mid-March, Cardiff post-punks Chain of Flowers are set to tour England in late April. Being the good Welsh ambassador that he is, the legend that is Huw Stephens interviewed several of the Welsh acts in Austin during the week of SXSW including Chain of Flowers.You can listen to the broadcast for the next 2 weeks on Radio Wales through here. 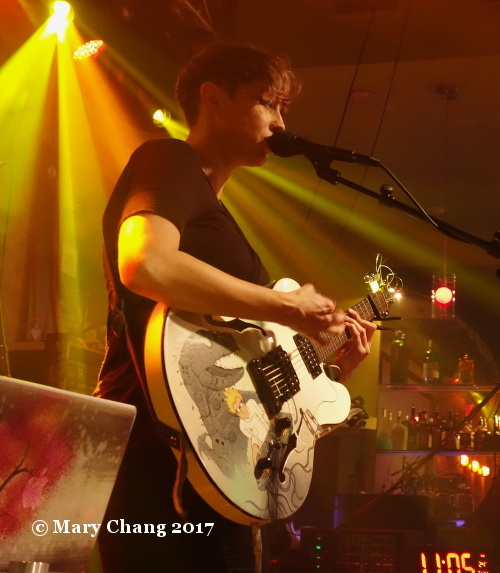 During his chat with frontman Josh Smith on Thursday at the British Music Embassy, they discuss the slight incongruity that this tour only includes English dates. No matter; I reckon they’ll be back playing shows on American shores soon enough. Tickets to the following shows are on sale now. 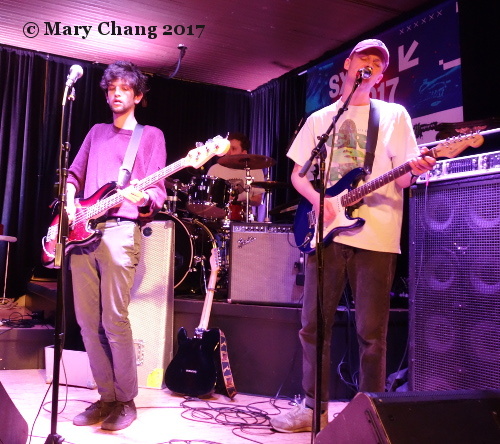 My review of their Thursday afternoon show can be read here; Carrie also caught them at the Music for Listeners afternon showcase at El Sapo, so her review of that is forthcoming. For more on Chain of Flowers on TGTF, follow this link. Derry electronic musician, composer and producer Ryan Vail was one of a handful of wonderful electronic acts I caught at SXSW 2017 who I couldn’t get enough of. Something I love about electronic composers is that they never seem to stop working. In honour of World Piano Day on Wednesday, the Northern Irish artist revealed two songs, one brand new and the other a rework of a previously released song, ‘East Berlin’. The original of the two, instrumental ‘We Drift We Wake’, has an accompanying black and white promo video. The series of visuals chosen, showing both the natural and manmade world, provide the perfect foil to Vail’s composition, which darts in and out of, then above the shadows. Moments of broodiness morph into more uplifting ones before the song concludes with a softer, delicious delicacy. Watch the video below. For read more on Ryan Vail, go here; we’ll be adding to our archive on the artist as we continue our review coverage of SXSW in the coming days.